Vibrant, vigorous and graceful! Folk dances of Rajasthan performed gracefully by the colorful crowd punctuate Rajasthan’s barrenness, turning even the deserts into fertile basin of limitless colors and variations of the amazing folks living here. One of these rich festivals is GAVARI, which is a distinct art form found in the cultural heritage of the Bhils who express the devotion and faith to Lord Shiva and his wife Parvati through Folk Dance, Music and Folklores. It also symbolizes human love for forests, animals and people. Quite unique and impressive, isn’t it? 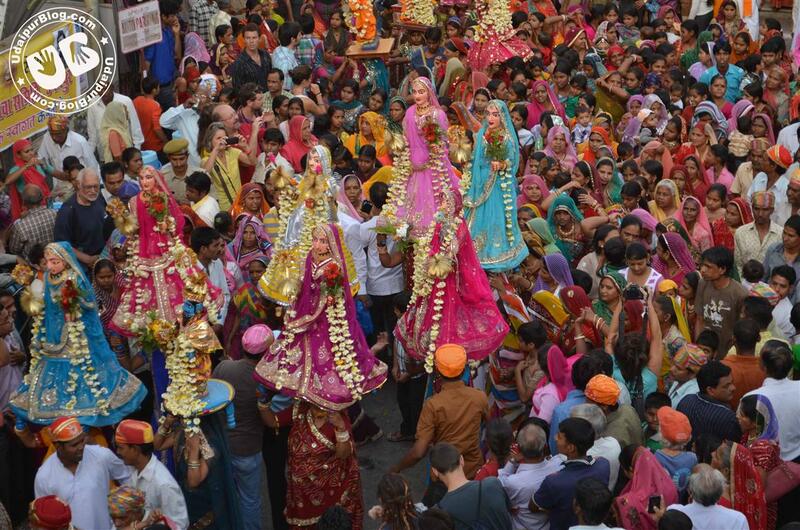 Rajasthan encompasses numerous tribes having distinct identities in term of costumes, dialects, beliefs and arts. People have nurtured a splendid tradition of folk songs and folk dances of which Gavari is unique in itself which is celebrated by Bhils. The Bhils are the original inhabitants and tribal of Mewar- Vagad area of southern Rajasthan which was gradually conquered and inhabited by Rajput kings and other northern settlers around 3rd to 4th century BC. 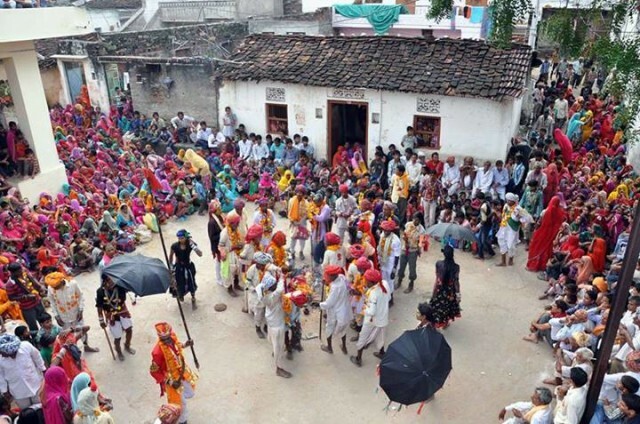 After the monsoons, in the months of September and October the forty-days-festival “GAVARI” is celebrated by Bhil tribe in Udaipur, Rajsamand and Chittor districts of Rajasthan. Whole male folk, even children participate in this dance-drama symbolizing a healthy environment and it intends to ensure the well-being to the community and the village. While only Bhils perform them, other castes attends the performances and offer donations. During this period, people do not eat any green vegetables, stay away from alcohol and avoid being non-vegetarian. They sleep on grounds and avoid taking bath (except on Dev-Jhulani Ekadasi). There is no definite origin of gavari. Some beliefs say the story of demon Bhasmasur who worshiped Lord Shiva, who pleased with bhashmasur’s devotion, granted him a strange wish that whenever he keeps his hand on anyone’s heads that person will die burning in fire. Thereafter, Bhasmasur started misusing the grant by killing innocent people on earth. Lord Vishnu to resolve the problem transformed himself into a beautiful woman named Mohini – the dancer and went to Bhasmasur. Bhasmasur fascinated by her beauty started imitating her dance and kept his hand on his head to copy mohini, thereby departed his life. Bhasmasur’s soul asked forgiveness from lord Shiva and appealed Lord to keep him alive in minds of people in return of his great devotion. Lord Shiva thereafter declared that, for paying homage to a great devotee like Bhasmasur, Gavri will be celebrated every year. 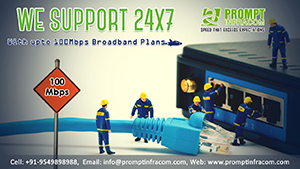 Since then this fest is organized in the region of Mewar by the Bhil Community. According to another belief, Lord Shiva had been ruler of Mewar ever since times unknown. Eklingji, a place about 17 km. 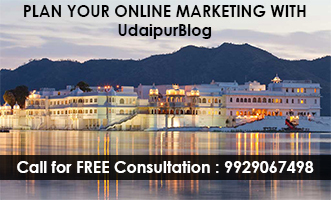 away from Udaipur, was believed to be his holy abode. Once, Goddess Parvati, his spouse, had gone to visit her father’s home for a long period of a month and a quarter. Deeply in love with his wife, the long separation ran Shiva into deep melancholic mood. To amuse him, the devotees Ganas (who were Bhils) devised an entertainment program made up of dancing, singing and theatrical activities. The event eventually became ritualistic and took form of Gavari, which is now an integral part of socio-cultural and religious life of the Bhils. In this folk play there are four kinds of characters – dev, humans, demons and animals. 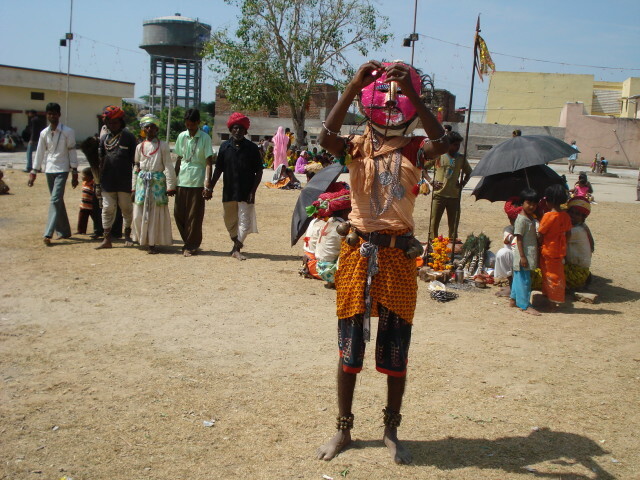 The RAI and BURIYA are the two main mythological characters to form the GAVARI, Bhil ritual performance. In GAVARI dance-drama group, there are two RAIs in form of PARVATI (GORJA) and MOHINI goddesses in female costumes who always stays or sits in the centre of the performing circle. The BHURIYA as Bhashmasur – keeps a wooden mask of black surrounding bull tail hair on his face and carrying a wooden stick or “Chhari“, always walks in opposite direction to other performers. The other priests as Bhairon and goddess Mata, stays with RAI as a guard to her. Mostly in the day time they perform GAVARI in the village where they enact different mythological and social episodes with MADAL and THALI as their main musical instruments. People go from village to village, especially to the villages where their daughters and sisters reside after getting married. Any open space can serve as a stage. For five to six hours each day; the troupe performs a series of episodes. On two occasions the festivity lasts all night. Like many Indian rituals, these scenes blend secular, folk, and Hindu epic characters with references to local daily life. Despite some comic scenes, the Gavari ritual is generally solemn, ending with the appearance of gods and goddess, and often including trance among both performers and audience. In Gavari, the last day of performance, rituals the Bhil Gavari players also dance and perform in the night as night awakening rituals. With other legends, they also perform the “Hiraniya Bhoot” or ghost performance in which two artists plays the role of ghost in which they covered the body with the grass. Gavari is played so skillfully by these tribal people that it produces the impact of an eye catching scene, the magical effect of which makes the viewers stop and stay on to watch it and get engaged until the episode reaches its end. Gavari, not only holds its audience spellbound for whole day long, but also refreshes and energizes performers as well. Gavari is thus a valuable cultural inheritance bestowed by the tribal from one generation to the other and from one century to the following one. I’m glad Neelanjana that you could write on Gavri, an article/assignment, I was planning and suggesting since more than two years but somehow missed the dates. Thanks to Sanjit for keeping the topic alive and finally managing it to publish. Very well written and well documented article……….